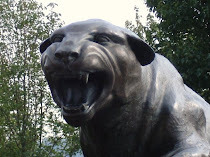 Pitt looked much better and mroe relaxed in their 71-46 win today over Binghamton that had most of us rushing home from work in order to watch. Just a matter of getting that first game under their belts, I guess. I was able to catch the end of the first half and the rest of game and have to say Pitt looked much better than the Wofford game. Of course, the reason is probably that Binghamton is playing with seven scholarship players and is not even a shell of last year's NCAA tournament team. Heck, their leading returning scorer didn't even average 5.0 per game last year. 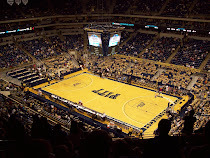 Still, it was encouraging to see something much more resembling the Pitt basketball we're used to. The defense was solid, and while the offense could have converted more shots, I was encouraged by the number of good passes and unselfish play. Surprisingly, there was one similarity between both teams coming into the game. Binghamton held on for a five-point win against D-II Bloomsburg while Pitt struggled as well in the comeback three-point in vs. Wofford. Ashton Gibbs played a heck of a game, leading all scorers with 22 (17 in the first half), and made 6 of 10 three-point attempts. Travon Woodall (10 points / 13 assists) and Nasir Robinson (7 points / 10 rebounds) also had pretty good games. Gibbs was actually close to a Pitt record for his first-half performance. Dante Taylor still looks a little out of sync to me. He finished with six points and four rebounds in 18 minutes. Driving home during the first half, on the radio broadcast, Curtis Aiken said that he expected Taylor to be a go to guy within a few games. I'm not sure that's entirely accurate as he doesn't look all that aggressive yet. He should turn out to be a good player, but it's clear he's still in need of polishing. I'm a bit surprised at Chase Adams' slow start - even though it's only been two games. In 42 minutes, he's only accumulated three points. While he looks like he's just trying to fit into the flow of the game and get a handle on the offense, at some point, he's got to make more plays if he expects to get that many minutes a game. All in all, a much better performance (though that was to be expected). As I said before, Pitt will get better. With Jermaine Dixon and Gilbert Brown back, they'll have an even deeper team, though I'm curious to see whose minutes will be cut. I'm guessing that other than Lamar Patterson, everyone that is playing now will still see significant minutes - nearly everyone will probably just see a small decline. Meanwhile, in the 'old news' section, Dixon is still at least a few games from returning. It'd be nice to get him back for the Wichita State game as I expect that to be a tough one...especially because it will practically be a home game for them. Jamie Dixon gets some love for his coaching of the USA Under-19 basketball team from over the summer. And it seems like the first PG basketball chat of the year was a bit thin.